Richard NIJIMBERE, born in Ruyigi, East of Burundi in December 1980. I grew up in a normal modest family, with my parents (both of them teachers) and my 4 sisters and my little brother till October 1993. In the 1993 civil both parents, one sister and my brother were killed the same day. I fled to live in refugee camp for 4 months in Tanzania and came back to Burundi in April 1994 to live with my grandparents. After the grandparents were also killed in 1997, I had no other choice. I then went to Maison Shalom, by the help of a friend of mine who were among the 25 children saved by Maggy, when she founded Maison Shalom in October 1993. Since then, Maison Shalom assisted me as many other children who were orphaned by the war, till I graduate from high school in 2002. In 2003, I got a scholarship from the government of Burundi and went to study Economics in Russian Federation. 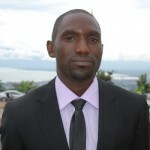 I came back to Burundi in 2009 and started working at Maison Shalom as its executive director. Each day when I wake up, I’m always excited to contribute to creating the same chance to go from destitute to autonomous citizens for the numerous youngsters who are in the same situation like me in 1997, just before I come to Maison Shalom.  Coordinate the communication between local staff and partners Maison Shalom to maintain accountability, transparence and positive momentum.